* Our advocacy for energy sustainability through space solar power that included sending an NSS delegation to a major Chinese energy conference and holding a successful press conference on the release of the ground-breaking first international assessment of space solar power. * Coordination with NSS chapters worldwide in conjunction with a new membership drive, the Campaign for the Future. * Outreach to the Students for the Exploration and Development of Space (SEDS) and holding our Board meeting at their annual conference in Boulder, Colorado. * Bringing over 180 foreign and US students to ISDC 2011 as part of the NASA/NSS Space Settlement Design Contest and providing a $5,000 scholarship to the international winning team from the Bruce M. Clark, Jr. memorial award fund. 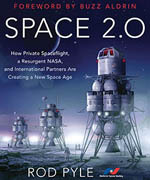 * Completion of a major revamping of a new NSS Roadmap to Space Settlement, to be published in 2012. 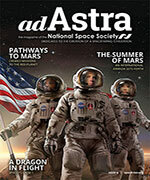 * Publication of the first papers in the new peer-reviewed NSS Space Settlement Journal. * New initiatives to advance the mission of the NSS, including the Call to Action for American Leadership in Civil Space developed by the NSS Policy Committee. * A grassroots visit to Congress, where, as the leader of the Space Exploration Alliance’s Legislative Blitz, the NSS promoted the commercial space sector, the commitment for next generation vehicle development that will enable exploration beyond Low Earth Orbit, and for a sustained commitment to space exploration, development, and settlement. * The wonderful experiences we all had last May at the 2011 International Space Development Conference held in Huntsville, Alabama and our hope to see you all at the ISDC in Washington, DC in May 2012. * The expansion of our social media outreach and upgrades to our website. Be sure to visit NSS on Twitter, Facebook, Second Life, and at www.nss.org. We are proud to share these highlights from 2011. Thank you for standing by NSS and believing in our mission. On behalf of the volunteers and staff at the National Space Society, have a wonderful holiday season and a happy New Year.